Former Leicester and England midfielder Keith Weller has died aged 58 after a long battle with cancer. Weller made 305 appearances and scored 47 goals for the Foxes in the 1970s, and he also won four England caps, scoring one goal for his country. The club said in a statement: "Keith was one of the club's all-time playing greats and he will be sadly missed." There will be a minute's silence before Leicester's game with Sunderland and the players will wear black armbands. Former team-mate and close friend Alan Birchenall said: "For me he was one of the five greatest ever players to pull on a Leicester shirt. "His death is a tragic loss not just for Leicester but for the whole of English football." Weller started his career with Arsenal and also played for Tottenham, Millwall and Chelsea, where he won his only medal - the European Cup Winners' Cup in 1971. 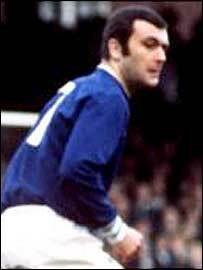 But it was his spectacular goals under Jimmy Bloomfield's entertaining Leicester team which saw him burst to national prominence. A mazy run in an FA Cup tie with Luton saw him win goal of the season and he scored a long-range own goal at Kenilworth Road a year later. His last goal for the club perhaps summed up his style - donning white tights he left Norwich defenders trailing in his wake as he scored a sensational solo effort. As well as his skills, Weller also built a reputation for being temperamental and he once refused to play in the second half of a league game with Ipswich in 1974. Knee injuries forced him to cut his career in England short and he then moved to the United States to coach the Tacoma Stars in Washington state. He retired in 1993 but continued to live in Seattle where he worked for a local television station. Weller was diagnosed in April 2002 with leomyofarcoma and Leicester fans helped raise £40,000 to fund his treatment.